And they are being cut down fast. This causes desertification, loss of species, and contribute to global warming. Get the facts on deforestation here. 130,000 square kilometers of forests are cut down or burned every year - equivalent to 3 times the area of Denmark, a football field every 1.4 seconds, or 100 large harvesters working non-stop. The main reasons for the loss of forests is production of timber, and making room for growing cattle, soy, and palm oil. Clearing forests for palm oil plantations is a growing problem. Palm oil is used to produce bio-fuels and cosmetics. In the Amazon, the loss of a critical mass of rain forest could tricker further dieback moving the forest into a vicious circle of self re-inforcing destruction. Deforestation is the clearance of forests by logging and/or burning (popularly known as slash and burn). Deforestation occurs for many reasons: trees or derived charcoal are used as, or sold, for fuel or as a commodity, while cleared land is used as pasture for livestock, plantations of commodities, and settlements. The removal of trees without sufficient reforestation has resulted in damage to habitat, biodiversity loss and aridity. It has adverse impacts on biosequestration of atmospheric carbon dioxide. Deforested regions typically incur significant adverse soil erosion and frequently degrade into wasteland. American football fields measuring 120.0 by 53.3 yards (109.7 by 48.8 meters). 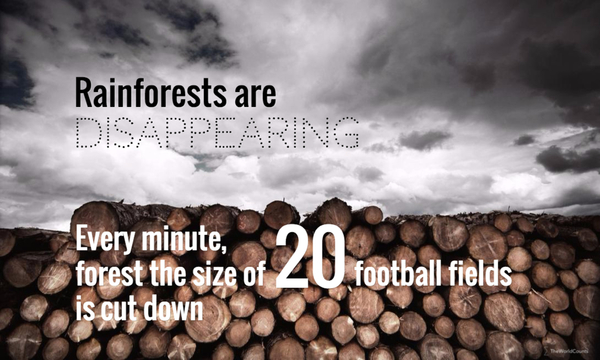 Interested in more facts like the facts on deforestation? Then plug in and subscribe to our newsletter.